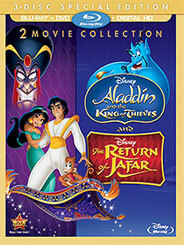 Now available exclusively through the Disney Movie Club… the ALADDIN II & III 2-Movie Collection! Featuring both THE RETURN OF JAFAR and ALADDIN AND THE KING OF THIEVES, this new Blu-ray/DVD/Digital HD Combo Pack will only be available to members of the Disney Movie Club in North America. Priced at $31.95 USD, the ALADDIN II & III 2-Movie Collection will arrive on January 05, 2016.